You will definitely need some knowledge about Cognos macros while working with TM1 cubes. A full list of Cognos macro commands can be found in the official documentation, so I just want to focus on practical examples here. 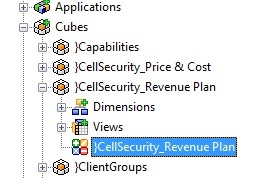 When you need to use more than one TM1 cubes in your report and you have a prompt in your report then you already have a problem: TM1 cubes structurally use shared (conformed) dimensions but that is absolutely meaningless for Cognos BI. For Cognos BI they are just different dimensions. In this case we based our macro on the time dimension of ‘Profit and Loss’ cube by the prompt macro. And use it in the related queries. On the other hand we can modify the returning result –MUN- in order to use it in the KPI cube related queries. Substitute command simply substitutes ‘Profit and Loss’ with the word ‘KPI’. TM1 cubes need to be published to Cognos Connection (with Framework Manager) in order to develop Cognos BI reports from them. In the publish process you have the option to swap item names in each dimension with an attribute of the dimension (if there are any). This is generally a good option because in TM1 cube development process you use codes in the dimensions as the item names and use actual names as attributes, aliases. Country dimension in the example below consists of country and region codes, but the country names are defined as attributes. So in the publish process in Framework Manager, country names should be swapped instead of codes. TM1 –Cognos BI integration is getting more common in the market (or sometimes in the form of Cognos Express edition) so I will try to focus on reporting from TM1 for a while. Let me start with some simple issues. We use levels in multidimensional reporting, but when we publish TM1 cubes for reporting we will not be able to see levels in the dimensions. We need to specify levels and name them in TM1 before publishing them as a package. This cube gives you the opportunity to name your levels in all your dimension. It seems it was due to a problem in one of the Cell Security cubes; in the rules there is still a reference to a group which was deleted a while ago. Deleting the related rule line solved the whole issue.